This protocol provides a method for the collection of mouse embryonic stem cell (mESC)-conditioned medium (mESC-CM) derived from serum (fetal bovine serum, FBS)- and feeder (mouse embryonic fibroblasts, MEFs)-free conditions for a cell-free approach. It may be applicable for the treatment of aging and aging-associated diseases. Bae, Y. U., Sung, H. K., Kim, J. R. Collection of Serum- and Feeder-free Mouse Embryonic Stem Cell-conditioned Medium for a Cell-free Approach. J. Vis. Exp. (119), e55035, doi:10.3791/55035 (2017). 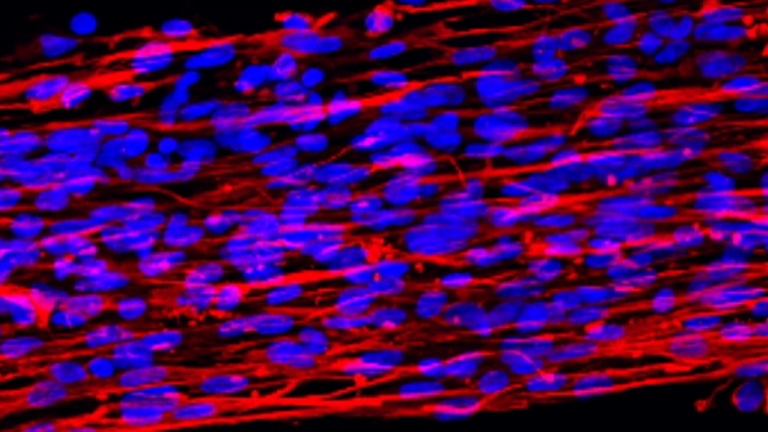 The capacity of embryonic stem cells (ESCs) and induced pluripotent stem cells (iPSCs) to generate various cell types has opened new avenues in the field of regenerative medicine. However, despite their benefits, the tumorigenic potential of ESCs and iPSCs has long been a barrier for clinical applications. Interestingly, it has been shown that ESCs produce several soluble factors that can promote tissue regeneration and delay cellular aging, suggesting that ESCs and iPSCs can also be utilized as a cell-free intervention method. Therefore, the method for harvesting mouse embryonic stem cell (mESC)-conditioned medium (mESC-CM) with minimal contamination of serum components (fetal bovine serum, FBS) and feeder cells (mouse embryonic fibroblasts, MEFs) has been highly demanded. 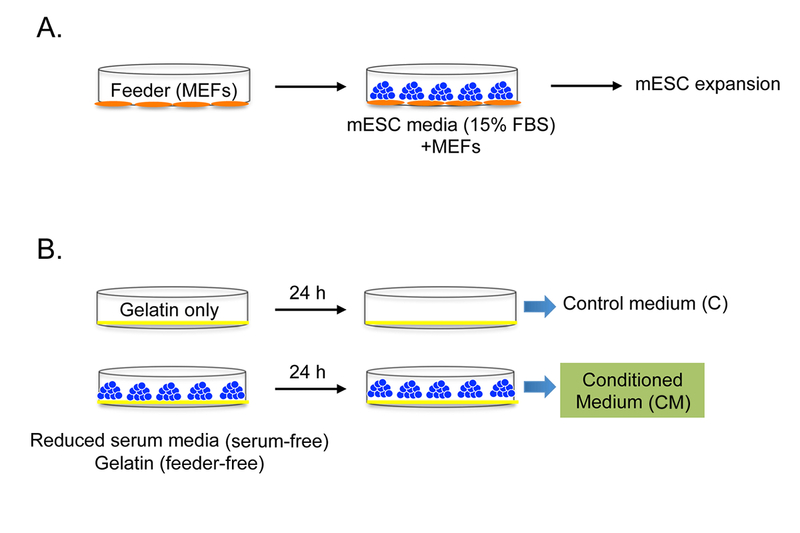 Here, the present study demonstrates an optimized method for the collection of mESC-CM under serum- and feeder-free conditions and for the characterization of mESC-CM using senescence-associated multiple readouts. This protocol will provide a method to collect pure mESC-specific secretory factors without serum and feeder contamination. 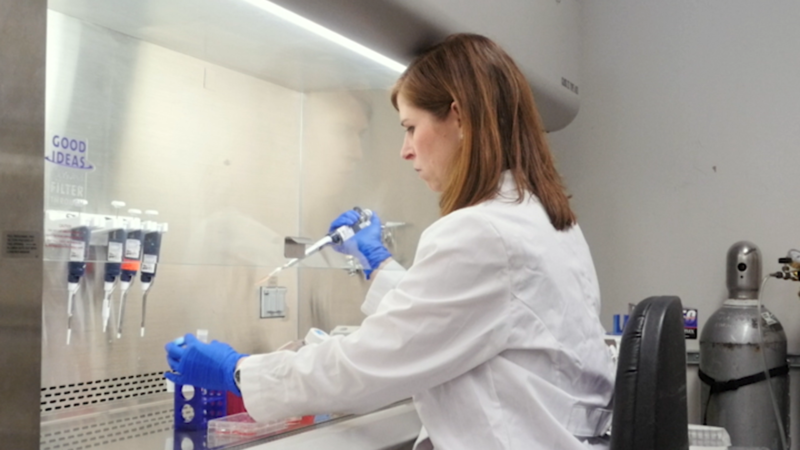 The goal of this protocol is to collect mouse embryonic stem cell (mESC)-conditioned medium (mESC-CM) from serum- and feeder-free culture conditions and to characterize its biological functions. In general, embryonic stem cells (ESCs) have great potential for regenerative medicine and cell therapy due to their pluripotency and capacity for self-renewal1-3. However, the direct transplantation of stem cells has several limitations, such as immune rejection and tumor formation4,5. Therefore, a cell-free approach may provide an alternate therapeutic strategy for regenerative medicine and aging interventions6,7. Senescence is viewed as a cellular counterpart to the aging of tissues and organs, characterized by a permanent state of growth arrest, altered cell physiology, and behaviors. Aging is the main risk factor for prevalent diseases including cancer, cardiovascular disease, type 2 diabetes, and neurodegeneration8. One of the obvious characteristics of aging is the decline in the regenerative potential of tissues, which is caused by stem cell aging and exhaustion9. Many significant studies have shown pharmacological molecules, such as rapamycin9, resveratrol10, and metformin11, and blood-borne systemic factors, namely GDF1112, that have the ability to consistently delay aging and extend life span. In the present study, mESC-CM has been harvested without serum (fetal bovine serum, FBS) and feeder (mouse embryonic fibroblasts, MEFs) layers to exclude the contamination of serum factors and secretory factors from MEFs. These conditions allowed for a serum- and feeder-free CM that consequently enabled the accurate identification of mESC-specific secretory factors. This proposed protocol is highly efficient, relatively cost effective, and easy to operate. This technique provides insights into the characterization of mESC-derived soluble factors that can mediate an anti-senescence effect, which may be used for the development of a safe and potentially advantageous cell-free therapeutic approach toward interventions for aging-associated diseases and other regenerative treatments. NOTE: A schematic of the serum- and feeder-free CM collection protocol is shown in Figure 1. Prepare 500 ml of medium to culture the MEFs. Supplement Dulbecco's Modified Eagle's Medium (DMEM) with 10% FBS (ESC quality), 50 units/ml penicillin, and 50 mg/ml streptomycin. Isolate MEFs from embryos following an established routine protocol13 and maintain them in MEF medium. Prepare 500 ml of medium to culture the mESCs. DMEM is supplemented with 15% FBS and 2 mM L-glutamine, 100 µM non-essential amino acids (NEAA), 100 µM β-mercaptoethanol, 100 units/ml leukemia inhibitory factor (LIF), 50 units/ml penicillin, and 50 mg/ml streptomycin. Prepare the gelatinized plates (5 gelatinized plates/1 mESC plate) by coating 10 cm cell culture dishes with 5 ml of 0.1% gelatin solution. Incubate for at least 10 min at room temperature. Prepare 500 ml of Reduced Serum Medium for a serum-free condition of mESCs. Supplement Reduced Serum Media with 1.2 g of sodium bicarbonate (pH 7.0). Filter through a 0.2 µm bottle-top filter. Prepare the senescence-associated β-galactosidase (SA β-gal) staining solution for the detection of senescent cells: 1 mg/ml X-gal (dissolved in dimethylformamide, DMF), 40 mM citric acid/sodium phosphate buffer (pH 6.0), 5 mM potassium ferricyanide, 5 mM potassium ferrocyanide, 150 mM NaCl, and 2 mM MgCl214. CAUTION: (Hazardous) DMF is a toxic and corrosive solution. Wear personal protective clothing (e.g., nitrile or latex gloves, a lab coat, and goggles) when handling solution. Use a fume hood. Prepare 500 ml of medium to culture human dermal fibroblasts (HDFs, NHDF-Ad-Der-Fibroblast). Supplement DMEM with 10% FBS and 100 units/ml penicillin and 100 mg/ml streptomycin. NOTE: Carry out all steps in a cell culture biological safety hood. Treat the MEFs with 20 ml of MEF medium containing 10 µg/ml of mitomycin C in a 15 cm cell culture dish. Incubate for 2 hr at 37 °C and 5% CO2. Aspirate the medium from MEFs. Wash the cells with PBS three times. Add 3 ml of trypsin-EDTA (TE, 1x) and incubate for 3 min at 37 °C and 5% CO2. After 3 min, neutralize the TE with 6 ml of MEF medium and centrifuge for 3 min at 300 x g.
Resuspend in 5 ml of MEF medium. Determine the cell number in the resulting cell suspension using trypan blue staining and a hemocytometer. Plate inactivated MEFs (feeder) at a density of 2 x 106 cells per 10-cm cell culture dish in MEF medium. Incubate for 24 hr at 37 °C and 5% CO2. Replace the MEF medium with mESC medium 24 hr after plating the feeder (on the following day). Plate the mESCs (G4 F1 hybrid ES cell) at a density of 2 x 106 cells on the feeder with mESC medium. Incubate for 48 hr at 37 °C and 5% CO2. NOTE: The anti-aging effect of mESC-CM is likely stronger when lower passage number mESCs are used15-17. We acquired a G4 mESC line from Dr. Andras Nagy in Lunenfeld-Tanenbaum Research Institute, Mount Sinai Hospital, 25 Orde Street, Toronto, ON, M5T 3H7, Canada. Keep the cells at a relatively high density and passage at a 70-80% sub-confluent state. Replace the medium with fresh mESC medium daily. Rinse the mESC plate with 5 ml of PBS. Add 1 ml of TE (2.5x) and incubate for 3 min at 37 °C and 5% CO2. After 3 min, neutralize the TE with 2 ml of mESC medium and centrifuge for 3 min at 300 x g.
Resuspend in 5 ml of mESC medium and plate 1 ml into each gelatin-coated culture dish (5 gelatinized plates/1 mESC plate) in mESC medium. Culture at 37 °C and 5% CO2 until 80-85% confluency is reached. Wash mESCs with sufficient PBS to cover the cells (8 ml per 10 cm plate) for 10 min per wash, for a total of three washes. Incubate in Reduced Serum Medium for 24 hr at 37 °C and 5% CO2. NOTE: The washing step is important to prevent FBS contamination. It is important to follow the incubation time18,19. Collect mESC-CM into a 50 ml conical tube and centrifuge for 20 min at 2,500 x g. Collect the supernatant solution (CM) after the centrifugation. Filter through a 0.2 µm bottle-top filter. NOTE: The effects of mESC-CM were validated by several methods, such as SA β-gal assay, cell cycle analysis, and qRT-PCR. Seed HDFs at a density of 2 x 104 cells per well in 6-well plates in HDF medium. Incubate overnight at 37 °C and 5% CO2. Following an overnight incubation, discard half of the HDF medium and add mESC-CM and control medium. Incubate for 72 hr at 37 °C and 5% CO2. Control medium is derived from serum-free medium (Reduced Serum Media) in a gelatin-coated dish in the absence of mESCs. Wash the cells with sufficient PBS to cover the cells (2 ml per 6-well plate) for 30 sec per wash, for a total of two washes. Add 3.7% paraformaldehyde (PFA) for fixation. Incubate for 5 min at room temperature. CAUTION: (Hazardous) Paraformaldehyde is a toxic and corrosive solution. Wear personal protective clothing (e.g., nitrile or latex gloves, a lab coat, and goggles) when handling the solution. Use a fume hood. Aspirate the fixation solution. Wash the fixed cells with PBS twice, as described in step 4.1.3. Add the SA β-gal staining solution (1-2 ml per well in a 6-well plate). Incubate for 17.5 hr at 37 °C. NOTE: It is not to be incubated in a CO2 incubator. Aspirate the SA β-gal staining solution and wash the cells with PBS twice, as described in step 4.1.3. Add the Eosin solution for counter-staining. Incubate for 5 min at room temperature. Wash the cells with PBS twice, as described in step 4.1.3. Image cells at 100X magnification using a light microscope and capture images using an attached digital camera for subsequent analysis. NOTE: The total number of cells can be counted in a blind manner and the percentage of SA β-gal positive blue cells can be calculated. Seed HDFs at a density of 8 x 104 cells per well in a 6 cm cell culture dish in HDF medium. Incubate overnight at 37 °C and 5% CO2. Following an overnight incubation, discard half of the HDF medium and add mESC-CM and control medium. Incubate for 24 hr at 37 °C and 5% CO2. Trypsinize the cells, as described step in 3.1, and centrifuge for 5 min at 300 x g. Wash the cells with cold PBS solution (PBS with 0.5 mM CaCl2 and 2% FBS, 1 ml per 1.5 ml tube) twice and centrifuge for 3 min at 2,500 x g. Resuspend in 100 µl of cold PBS solution. Fix the cells by dropping 200 µl of cold ethanol while vortexing. Store at 4 °C for at least 1 hr. Wash the cells with cold PBS solution twice, as described in step 4.2.3. Resuspend the cells in 250 µl of sodium citrate buffer (1.12%, pH 8.5) containing 50 µg/ml RNase. Incubate for 30 min at 37 °C. Add 250 µl of sodium citrate buffer containing 50 µg/ml propidium iodide. Incubate for 20 min at room temperature. Measure the 10,000 cells in each sample using flow cytometry20. Seed HDFs and add mESC-CM, as described in steps 4.1.1 and 4.1.2. Isolate total RNA from the HDFs using an RNA extraction kit according to the manufacturer's protocol. Quantify the extracted total RNA using a spectrophotometer21. Synthesize cDNA by adding 1 µg of the total RNA to a 20 µl of reaction mixture containing oligo (dT) primers and M-MLV reverse transcriptase, according to the manufacturer's protocol20. Measure the amplification of the cDNA with a real-time PCR machine, using Green PCR master mix and specific gene primers (Supplement Table 1). Normalize the data with GAPDH expression. Use the following PCR protocol: initial denaturation for 10 min at 95 °C; 45 cycles for 15 sec at 95 °C, 20 sec at 55 °C, and 35 sec at 72 °C; and the melting curve stage for 15 sec at 95 °C, 1 min at 60 °C, 30 sec at 95 °C, and 5 sec at 60 °C15. 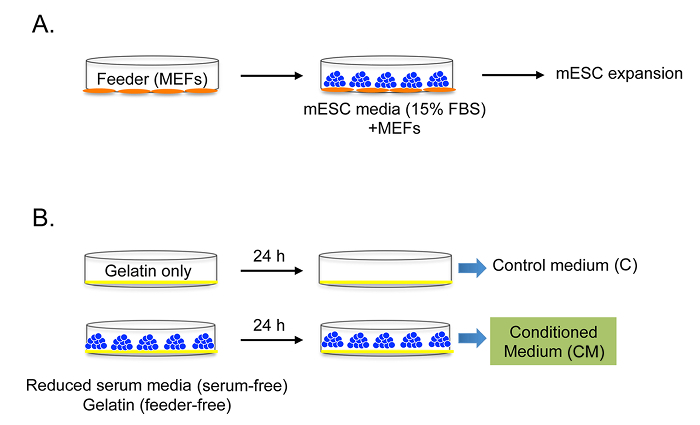 Originally, mESCs are maintained on an MEF feeder in mESC medium with FBS and other supplements (Figures 1A and 2A). CM was collected from mESCs in Reduced Serum Media without a feeder layer, FBS, or other supplements (Figures 1B and 2B). This culture condition allows us to collect mESC-specific conditioned medium without potential contamination by the factors from the feeder, FBS, or other supplements. The control medium was collected under the same culture conditions, without mESCs. mESCs show different morphologies between the two culture media: i) normal mESC culture conditions (Figure 2A) and ii) serum- and feeder-free culture conditions (Figure 2B). The mESC colonies grew on an MEF layer and demonstrated an oval and shiny appearance under the normal mESC culture conditions (Figure 2A). On the contrary, the mESCs in the serum- and feeder-free culture conditions showed a flattened and irregular morphology (Figure 2B). The functional characterization of mESC-CM was achieved by senescence-associated methods, such as SA β-gal assay (Figure 3A), cell cycle analysis (Figure 3B), and qPCR (Figure 3C). 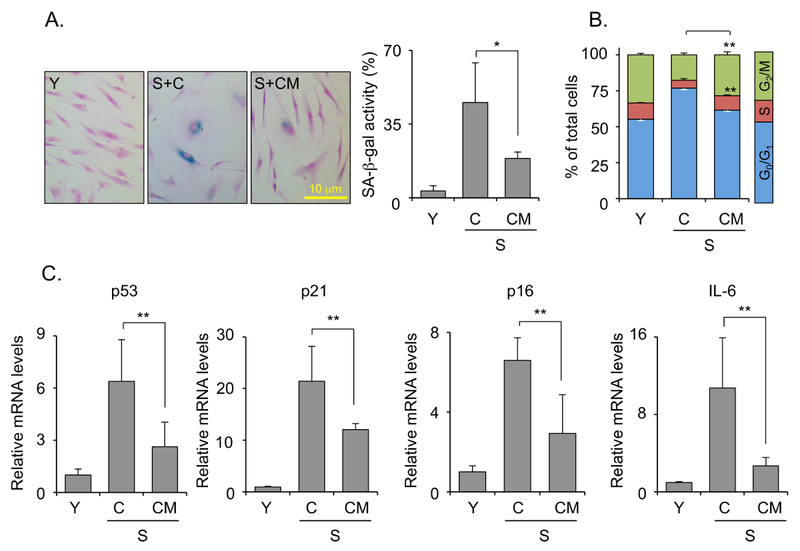 Treatment of senescent HDFs with mESC-CM decreased the number of positive SA β-gal-positive cells, which is an indicator of cellular senescence (Figure 3A). 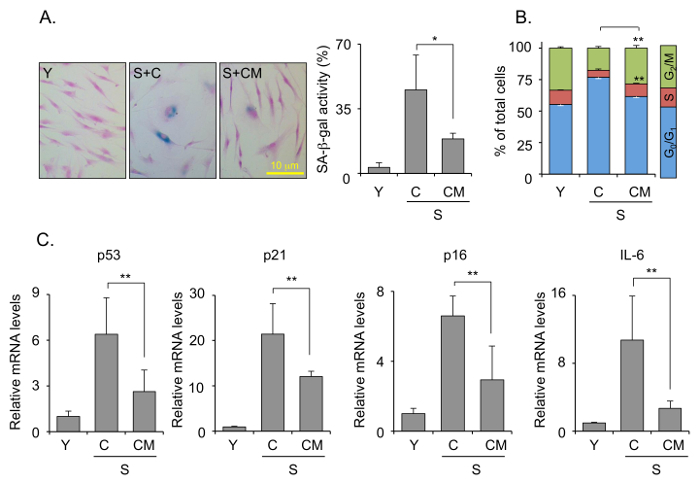 Cell cycle analysis revealed that mESC-CM treatment dramatically increased the number of cells in the S and G2/M phase, whereas it reduced the number of cells in the G0/G1 phase (Figure 3B). In addition, mESC-CM treatment decreased the senescence-associated gene expression levels (namely, p53, p21, and p16) and the senescence-associated secretory phenotype (SASP) expression levels (IL-6). Figure 1: Preparation and optimization of mESC-CM. Experimental strategy for the preparation and optimization of serum-free and feeder-free CM. (A) Normal mESC culture condition and (B) serum- and feeder-free mESC-CM culture condition. C: control medium without FBS and MEF; CM: conditioned medium without FBS and MEF. Modified with permission from Bae et al.15. Please click here to view a larger version of this figure. Figure 2: Bright field images of mESCs. mESCs under (A) normal conditions and (B) serum- and feeder-free conditions. Yellow arrows indicate feeder cell (MEFs) in normal mESC culture conditions. Scale bars = 100 µm. Please click here to view a larger version of this figure. Figure 3: Characterization of the anti-aging effect of mESC-CM. (A) SA β-gal activity staining and the percentage of SA β-gal-positive cells. (B) Cell cycle analysis by flow cytometry. (C) Expression levels of senescence-associated gene expression levels (p53, p21, and p16) and senescence-associated secretory phenotype (SASP) expression levels (IL-6) by qRT-PCR. Values are the mean ± SD. Figures are representative of three independent experiments. Statistically-significant differences between groups were identified by one-way ANOVA and Tukey's post-hoc test. *p <0.05, **p <0.01. Y = non-senescent cells; S: senescent cells; C: control medium without FBS and MEF; CM: conditioned medium without FBS and MEF. Scale bars = 10 µm. Modified with permission from Bae et al.15. Please click here to view a larger version of this figure. For the successful collection of serum- and feeder-free mESC-CM, the following suggestions should be taken into consideration. The most critical factor is using early passage mESCs for the collection of mESC-CM. Previously, it has been shown that early passage mESC-CM has better anti-aging effects compared to late passage mESCs. The passage number of mESCs has been reported to affect their developmental potential16 and pluripotency17. While additional research is needed to analyze the specific factors of the mESC secretome, which induce anti-senescence effects, we can currently conclude that mESC-CM is sufficient to decrease senescence at the cellular level. The identification of mESC-specific secretory factors that revert senescent cells back to young cells will be critical for future studies. For high-quality analyses on the secretory molecules, such as antibody array15 and secretome analysis, the washing step during the medium collection process (step 3) is critical. If the washing step is not properly conducted, the secretory molecules will be contaminated by serum (FBS) components18,19. The serum- and feeder-free incubation time (24 hr) is very important in the medium collection process (step 3), as the longer incubation time (over 24 hr) may increase the possibility of cell autolysis or apoptosis by starvation under the serum- and feeder- depleted conditions18,19. The normal ESC culture condition requires a feeder layer for long-term culturing of undifferentiated cells, as the feeder secretes a large number of molecules22. The gelatin-coated plate prevents the possibility of contamination from the feeder cells. The mESC-CM, harvested from serum- and feeder-free culture conditions, has an anti-senescence ability in senescent HDFs. Anti-senescence effects of mESC-CM have been demonstrated by senescence-associated multiple readouts, such as SA β-gal activity; an enhanced proliferative potential (cell cycle analysis); and reduced p53, p21, p16, and IL-6 gene expression levels (Figure 3A-3C). When human primary cells are treated with mESC-CM, xeno-contamination would be a critical issue for clinical application. Therefore, an investigation of the secretory factors from human ESCs or iPSCs would be an important future study for the clinical application of CM derived from human origins. The convergence of a cell-free approach based on a stem cells and an anti-senescence study is expected to expand the current understanding of senescence-associated diseases, resulting in greater insight into improvements on therapeutic approaches. This research was supported by the Basic Science Research Program (2013R1A1A2060930) and the Medical Research Center Program (2015R1A5A2009124) through the National Research Foundation of Korea (NRF), funded by the Ministry of Science, ICT, and Future Planning. This research is also supported by a Start-up Operating Grant from The Hospital for Sick Children (H. K. Sung). We would like to thank Laura Barwell and Sarah J. S. Kim for their excellent help in editing this manuscript and Dr. Andras Nagy for providing the G4 mESC line. Lavasani, M., et al. Muscle-derived stem/progenitor cell dysfunction limits healthspan and lifespan in a murine progeria model. Nat Commun. 3, 608 (2012). Woo, D. H., et al. Direct and indirect contribution of human embryonic stem cell-derived hepatocyte-like cells to liver repair in mice. Gastroenterology. 142, 602-611 (2012). Lee, A. S., Tang, C., Rao, M. S., Weissman, I. L., Wu, J. C. Tumorigenicity as a clinical hurdle for pluripotent stem cell therapies. Nat Med. 19, 998-1004 (2013). Moon, S. H., et al. A system for treating ischemic disease using human embryonic stem cell-derived endothelial cells without direct incorporation. Biomaterials. 32, 6445-6455 (2011). Tongers, J., Roncalli, J. G., Losordo, D. W. Therapeutic angiogenesis for critical limb ischemia: microvascular therapies coming of age. Circulation. 118, 9-16 (2008). Lazarous, D. F., et al. Basic fibroblast growth factor in patients with intermittent claudication: results of a phase I trial. J Am Coll Cardiol. 36, 1239-1244 (2000). Adams, P. D. Healing and hurting: molecular mechanisms, functions, and pathologies of cellular senescence. Mol Cell. 36, 2-14 (2009). Harrison, D. E., et al. Rapamycin fed late in life extends lifespan in genetically heterogeneous mice. Nature. 460, 392-395 (2009). Baur, J. A., Ungvari, Z., Minor, R. K., Le Couteur, D. G., de Cabo, R. Are sirtuins viable targets for improving healthspan and lifespan. Nat Rev Drug Discov. 11, 443-461 (2012). Martin-Montalvo, A., et al. Metformin improves healthspan and lifespan in mice. Nat Commun. 4, 2192 (2013). Loffredo, F. S., et al. Growth differentiation factor 11 is a circulating factor that reverses age-related cardiac hypertrophy. Cell. 153, 828-839 (2013). Jozefczuk, J., Drews, K., Adjaye, J. Preparation of mouse embryonic fibroblast cells suitable for culturing human embryonic and induced pluripotent stem cells. J Vis Exp. (2012). Debacq-Chainiaux, F., Erusalimsky, J. D., Campisi, J., Toussaint, O. Protocols to detect senescence-associated beta-galactosidase (SA-betagal) activity, a biomarker of senescent cells in culture and in vivo. Nat Protoc. 4, 1798-1806 (2009). Bae, Y. U., Choi, J. H., Nagy, A., Sung, H. K., Kim, J. R. Antisenescence effect of mouse embryonic stem cell conditioned medium through a PDGF/FGF pathway. FASEB J. 30, 1276-1286 (2016). Nagy, A., Rossant, J., Nagy, R., Abramow-Newerly, W., Roder, J. C. Derivation of completely cell culture-derived mice from early-passage embryonic stem cells. Proc Natl Acad Sci U S A. 90, 8424-8428 (1993). Li, X. Y., et al. Passage number affects the pluripotency of mouse embryonic stem cells as judged by tetraploid embryo aggregation. Cell Tissue Res. 327, 607-614 (2007). Mbeunkui, F., Fodstad, O., Pannell, L. K. Secretory protein enrichment and analysis: an optimized approach applied on cancer cell lines using 2D LC-MS/MS. J Proteome Res. 5, 899-906 (2006). Makridakis, M., Vlahou, A. Secretome proteomics for discovery of cancer biomarkers. J Proteomics. 73, 2291-2305 (2010). Kim, K. S., et al. Regulation of replicative senescence by insulin-like growth factor-binding protein 3 in human umbilical vein endothelial cells. Aging Cell. 6, 535-545 (2007). Kim, K. S., et al. Induction of cellular senescence by insulin-like growth factor binding protein-5 through a p53-dependent mechanism. Mol Biol Cell. 18, 4543-4552 (2007). Eiselleova, L., et al. Comparative study of mouse and human feeder cells for human embryonic stem cells. Int J Dev Biol. 52, 353-363 (2008).